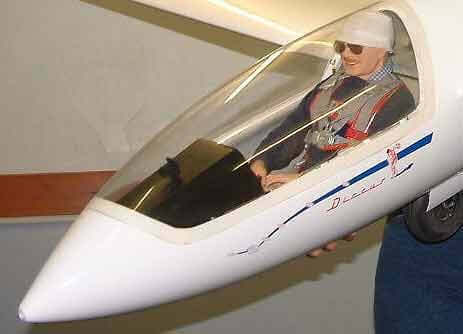 You have completed the building of your scale glider and now you need to make it to look like the full size glider that first inspired you. You may have already finished your model in the correct colour scheme, but what about all those complicated graphics that adorn the sides of gliders. How do you go about creating them? If you are a competent artist you can, of course, resort to painting on your graphics with a brush or an air brush, but for the rest of us there is a simple solution available, at a place nearby, which can answer all of our needs. The place is a local signwriter who will use self adhesive vinyl stickers to produce his signs. If you take good quality photos ofthe graphics you require and the dimensions for each, then he will be able to reproduce them for you. He will scan the graphics into his computer and then convert the pictures into .eps files ( a computer drawing format) which can then be used to control his Vynyl cutting machine. The system is very simple, if your original photos are well detailed, but if they are not he will have to do more work at extra expense to fill in the missing detail.You can expect a straight forward set of decals for a quarter scale glider to set you back around £20. However, if you are confident in using your computer, you can keep the cost down by drawing your own graphics using any program that will save files in the .eps format. (I use Freehand but Adobe Illustrator is another good one) Designing them yourself can give hours of enjoyment and of course this way you get exactly what you want. You will then be able to take your designs on disc or simply eMail the file to your local signwriter for production. On this page are examples of Artwork carried by Spectrum Signs of Southampton. This company is used many members of the Southampton Soaring Society. You will find their address in the left column of this page. They already have on file decals for various gliders and the list will continue to grow. The large solid colour decals are best done on Vinyl as discussed above, but for the smaller more intricate multicoloured logos you can make good use of your inkjet printer or even better a colour laser printer. So how do we make our decals? Fortunately there are many new papers on the market that will help us, for very little outlay. You can purchase good quality ink jet and laser waterslide decal paper from various places these days, Homecrafts being just one of them. You will be amazed at the range that is available. Consider this DG graphic which sits at the top of the rudder on all DG gliders. You could use your white paper to print onto and then cut out the graphic for application. This would overcome the ‘White’ problem but you would have to cut carefully around the logo because of the edge shading. This would leave a white edge the thickness of the paper showing around the decal but would be so small as to be insignificant. Another better option on any white surfaced glider is to print onto transparent paper that will show no visible edges and the white colour will show through from the glider. If your model is coloured, then you have to use the white paper, but when the decal is cut out, use a felt tip pen to colour the white edges to match your model. Before printing, size the image to your models scale in your favourite graphics program. One final tip, always overspray your decal with a clear lacquer to make it waterproof. If you have no spray handy then sellotape applied prior to cutting out the decal will do just as well. People with laser printers can omit this stage, as their ink is already waterproof.